Many businesses need funding and/or investment to be able to launch or scale-up. The common route is equity share and whilst readily available these are not without pitfalls and obstacles. Working with many different companies,investors and financial groups has given us an insight into the options available for companies, the risk and benefits of each option and not just from a legal perspective but a practical and operational one. This unique position enables us to, without conflict, set out all the options available to our commercial clients,advise them on the selling features of each, package the legal work accordingly and then refer them to the correct financial advisor to progress along their chosen route. The most important thing is a business is armed with all the facts and options and understands what is needed and is wanted before entering the arena to negotiate for investment. What should you be asking yourself before seeking investment? Firstly, you and your founders must decide on whether you are prepared to give away equity and if so how much control are you willing to transfer. What level of control do you need to retain to be able to operate your business on a day-to-day basis? There are situations where the founders of a business who invested years of their life into the company, are voted out of the company by investors or driven out due to change.Be careful to consider how involved you wish to remain. You must value your business now and what you predict it to be worth before making any decisions on the level of equity/price you are willing to accept. This must be transparent and the workings sensible otherwise, you will immediately put off a savvy investor, so back up what you say! The decision on the type of investment vehicle you choose will be assisted if you agree now, with your co-founders, on whether the objective is to grow and manage the business or package this for an imminent sale because, a longer-term aim is a completely different process to a short-term build and sell objective. Ultimately,investors want to know how they will get a return on their investment, make it clear within your business plan what your exit strategy is also. How do you secure this investment? b. Legal documents need to be in place and more importantly up to date and relevant. i. A Co-founders agreement must be in place for the protection of the business. It must adequately and concisely address all relevant issues so that an investor trusts the business is secure. ii. All the business IP must be protected adequately and assigned fully to the business as this will be an asset the investor will want to benefit from. iii. There must be adequate contracts in place with suppliers, customers and employees so the investor knows you are a serious business and that it’s less likely any unexpected disputes can arise or that they cannot be resolved. v. Any regulatory requirements or registrations must be in place. c. Insurance – the investor will want to make sure all cover is adequate and in place. d. Polices – depending on your business certain legalities are necessary such as, Cyber Protection if in the advanced technology sector, employment/contractors’ policies specific to IP assignment. 2. A credible business plan. Investors are put off by long technical documents; they want to know what your product/service is, how its performing and how it is to be marketed; Investors want to know that they will generate a return & that you have a risk management strategy. 3. 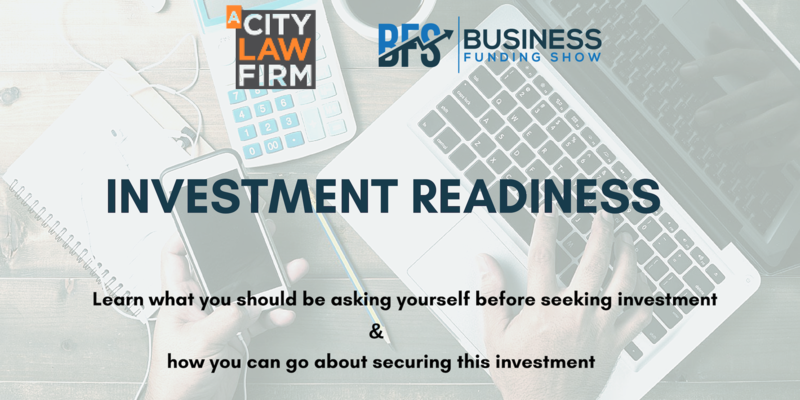 Be prepared: be confident in your proposal, understand your business so you can address all the questions adequately, be clear on what it is you want and your objectives, as it’s as important the investor aligns with this as much as you fulfill his objectives. Anticipate what they are likely to ask and think about certain scenarios. Make sure their potential questions will not expose flaws in your business strategy. 4. Understand your market. Make sure you can demonstrate a knowledge of the market that your product/service is in and concisely communicate this to your investors. Investors will be holding confidence in you that you know your competitors and will want to know how you will respond to competition to put your business ahead. 5. Be informed: understand all the options available to you so you are not forced down a route you didn’t mean to go, take time out for adequate advice and do not be afraid to ask questions, take calculated risks, but negotiate for your needs. Securing investment, don’t get pressured into the wrong decision. Are you looking for invaluable legal advice in the field of tech, investment or startups? Why not check out London's most start up friendly law firm here. Are you looking to get the right support in order to improve and expand your business? Come along to UK & EU's only funding show and steal the chance to network with industry leaders in the field of funding. Make powerful connections with speakers from British Business Bank, London Stock Exchange, A City Law Firm to name a few. The Business Funding Show would take place on Thursday, 21st Feb 2019 from 10 am onwards. Book your tickets here.